Adrian was supervising bath time this weekend when Martin, from the tub, started describing the stuffed animals in his bed: Curious George the monkey, Maisie the tiger, Mitt Romney the elephant, Boo the dog, Godiva the bear and—an aye-be’el. I happened to be passing through the bathroom. Adrian looked at me, as if I should know what Martin was talking about. Martin’s kindergarten teachers have said that he often surprises them by being completely on top of a lesson even when he doesn’t seem to be paying attention. Where Martin appears to be directing his focus, in other words, can be deceptive. We might have been to that lighthouse shortly after Martin’s diagnosis, before biomed, when he still drifted the perimeter of rooms and ignored his own name. But he remembers. It’s all in that head of his. A close friend of mine was in an elevator with her five-year-old ASD son, who is making wonderful progress but still mostly pre-verbal. (I’ll call him Jason.) They’d had a horrible morning; because of a snowstorm, Jason’s school bus was delayed, they’d had to return to their apartment to call the bus company, Jason had become too warm in his jacket, and finally they were on their way back down to wait again for the bus. Frustrated, Jason acted out in the elevator. Jason’s mom, my friend, immediately restrained him and prevented the situation from escalating. There are, of course, a thousand tidbits that gall me about what happened to my friend and her son in that elevator. The most galling is this: Did the ignoramus who made that comment assume that, because Jason has limited speech, he can’t hear and comprehend? Did he think that an intelligent and creative boy doesn’t know what’s being said about him? Jason probably didn’t look like he was listening, or understanding. Martin probably didn’t look like he was eavesdropping on Adrian’s phone calls, either. But they were. They always are. Remember the post about really crappy days? Today is a really crappy day! Stick with me, though. This isn’t going to be an unhappy post. I’ve been doing too much frustration posting lately, like when I used to do too much middle-of-the-night posting. It’s just not healthy. So today, in this post, I’m going to write myself back to happy. Most nights he’s taking two hours or more to fall asleep, and waking two or three times between midnight and 5:00 a.m. He is tired all the time. He’s also “floppy” again. He is extremely hyperactive; charcoal tablets, salt/baking soda baths, and clay baths haven’t helped. His teachers have been telling me that he’s inattentive in class and not responding to his name. He had a pee accident at school this week. Sunday afternoon he had a meltdown so severe that my husband was unable to get him out of the car. We’ve been on nystatin two weeks, and the yeast hasn’t responded, as far as I can tell. Martin remains itchy. In general, I have an unhappy kid right now, and I feel horrible about it. Obviously, we need to make changes. Things have got better since I sent that email. I took Martin off nystatin, switched him to full GAPS diet (more on that in a later post), and on the advice of his homeopath, increased some of his “support” drops (Inflamma-Tone and Liver-Tone, among others). He took a turn for the better, in terms of increased awareness, and some reduction in time to fall asleep, and less itchiness. This past Tuesday afternoon, he got sick. The school nurse called me to retrieve him, and I ended up having to keep him home the rest of the week. If you’re wondering why I haven’t posted much this week, try being housebound with Martin. While sick, Martin had good language and connection, but he slept poorly and was crabby. Second: this day. Adrian’s alarm woke us at 7:00. Adrian and I got home last night at 11:00 pm from the City. I had to feed the cats and strain Martin’s chicken broth, so it was 12:15 am when I got to bed and 12:40 when I got to sleep. Martin woke three times between then and 7:00 am. He was never up long. Still, each time I had to get up, tuck him back in, and then get myself back to sleep. Figuring 30 minutes for those diversions, I got just under six hours’ sleep, interrupted. This was after a week when I was exhausted from his night waking and unable to nap because he was home with me. Martin was still sleeping at 7:00 am. I would have preferred to get at least 30-to-45 more minutes myself. Not possible: Adrian had scheduled an early gym visit, because his trainer had something else to do later today. So up we were. I had Adrian fed and out the door before Martin left his bed. I tried to convince Martin to dress himself. He did, eventually, but required 15 minutes of crying and whining to reach that point, and even then didn’t make it to the socks. He declared breakfast—chicken broth, salmon sausage, and a bit of banana—to be “all things I like!” Still, he dawdled. We ended up rushing to get out the door for his 10:00 am special-ed reading program at the public library. Amidst the hurry, Martin had a meltdown because it was too warm to wear his heavy knit “dog” hat. We drove to the library. Martin had another meltdown because I said, as I do whenever Curious George comes along, that Curious George had to wait in the car. I delivered Martin, still teary-eyed, to the reading program. Then I walked to FedEx to ship my kid’s stool samples to a lab (biomed parents know that ritual) and proceeded to a coffee shop, where I sat alone, missing the easy camaraderie of the parents from Martin’s old Saturday-morning playgroup in the City. When I returned to retrieve Martin, he had a meltdown because I hadn’t brought Curious George into the library with me. I suggested that we go to the car, where Curious George was waiting. Martin screamed. In the library. My suggestion, it turns out, was wholly unacceptable because Martin wanted Curious George to “play with him” in the library. By the time we got home, I could feel myself coming down with whatever’s had Martin sick this week. I told Adrian I needed to lie down for 20 minutes. I climbed in bed and shut my eyes. Within five minutes I opened them again. Martin was running around the house yelling, “Mommy! Mommmm-eeeeee!” I could hear Adrian in his home office, on a call. Not wanting his call disturbed, I said, “Martin, I’m in the bedroom.” Martin ran into the bedroom and jumped on me. I got up. I took ibuprofen for my head, which ached. For lunch I prepared raw carrots and broccoli florets with avocado-and-fermented-garlic dip. I called Adrian from his home office to come eat with Martin. Because the meal, which I named “dippin’ plate,” was new, I wanted Martin to see that Adrian was eating the same. Martin, however, claimed he needed the potty. He disappeared for 10 minutes, during which Adrian finished his own dippin’ plate and returned to his home office. So much for eating what Daddy is eating. After I finally got Martin back to the table, he left repeatedly, running to our bedroom, the farthest point in the house, and laughing. It may go without saying that we ended up in a rush to get to his afternoon social program at the JCC, and that I left the kitchen a disaster, and that I didn’t get a chance to feed myself much, and that I was feeling worse by the minute. On the way to the JCC, Martin peed himself and lied about it. Which brings us to this moment. I’m in the JCC library, blogging while Martin enjoys his social program. Martin took 15 minutes of crying and whining to get dressed. This was partly my fault. I broke routine by asking him to dress himself as soon as he woke, before he even went to the bathroom or ran around. And yet he still got managed the task. As a bonus, when I asked him to pull his arms inside his shirt, he looked down and said, “Oh, it’s on backwards,” and then cooperated fully. Speaking of Martin’s (and now my…?) illness, Martin had a fever! It was the second time he’s had a fever since we moved last summer. Fever is good. Fever is healing. 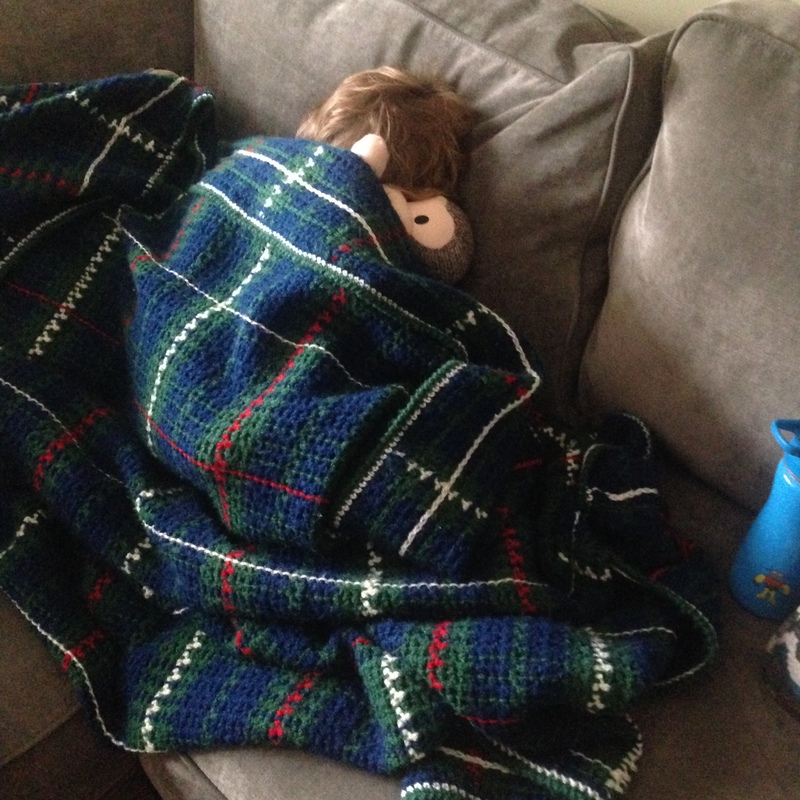 Fever indicates that Martin’s immune system is responding appropriately to illness. That’s progress. Martin had repeated meltdowns today. There’s a pretty good explanation: He too is tired, and not feeling so hot. (Lest you think I’m dragging a sick kid around town, it was Martin who insisted that he felt better and could go to the library this morning.) Plus, the meltdowns didn’t last long. When he wanted the dog hat, we talked, and he agreed to get Curious George instead. When he screamed in the library, I asked, “Remember last week when you screamed at church and we had to leave?” He took the hint and calmed himself down in exchange for extra playtime at the library. I offered five minutes playtime. He bargained me up to seven minutes. That works. Martin didn’t eat with Adrian, and then ran away from the table. Each time, I kept my cool. I went to the bedroom where he’d run, took his upper arm, and walked him back to the table without a word. After a couple tries and not getting the attention he wanted, Martin settled down. In the end, he ate the dippin’ plate. 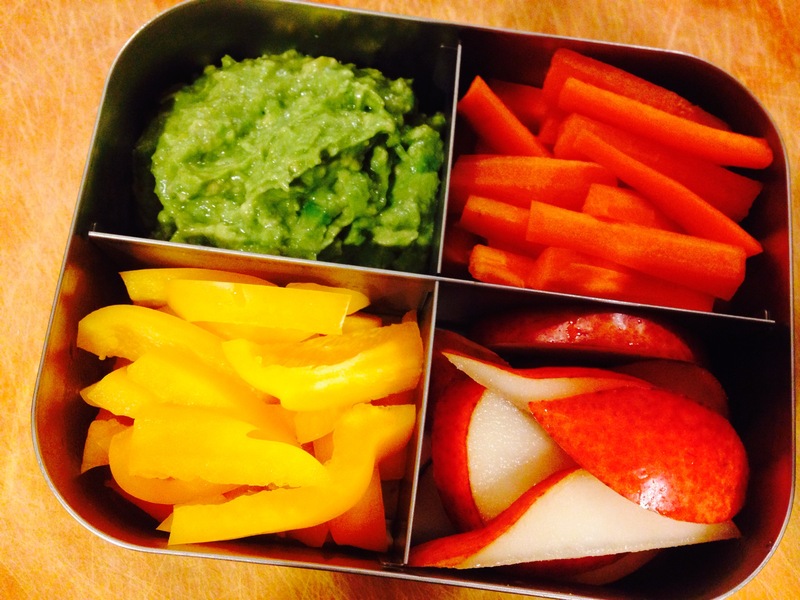 The GAPS diet isn’t easy, especially when it comes to packing for school. If Martin accepts a dippin’ plate once or twice more at home, I’ll give it a go for school lunch. Hurray for new stuff. Martin peed on the way to the JCC. My fault. In our rush to leave home, I didn’t have him sit on the potty. I figured he had just gone during lunch, and I didn’t want to be later than we already were. In the car I could tell he needed to go. When I asked him, he said he could hold it till we got to the JCC. That never works. At least I had spare pants and underwear in his backpack, so the afternoon wasn’t ruined. I’m getting sick. But the ibuprofen has kicked in. One of my March Madness brackets is doing fantastic in Adrian’s office pool, with all 16 of its Sweet picks intact. My favorite team plays tonight. And now I’ve written myself happy again. 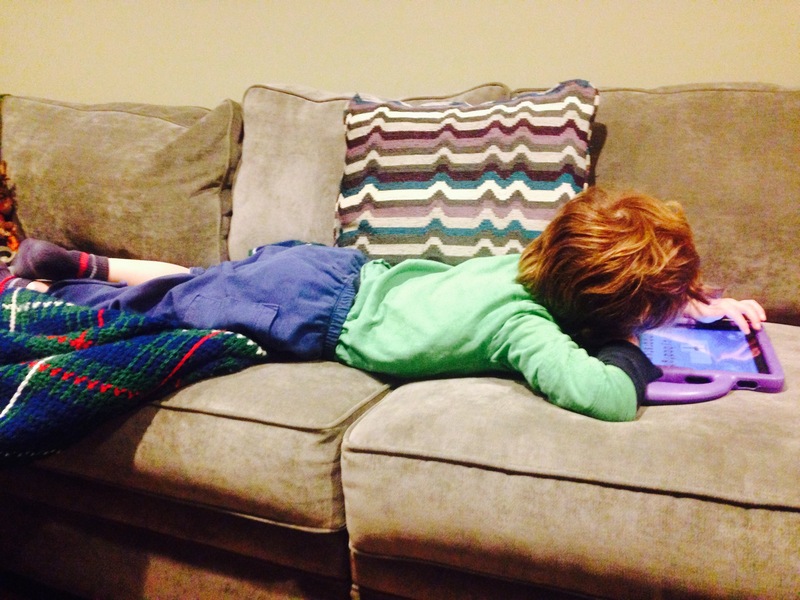 Martin, sick but managing his iPad. Curious George lending Martin a hand to recover from illness. Through the community that is Autism Parenting in the New York City Area (“APNYCA.” I just coined the acronym. You saw it here first. ), I know a mother who is a recent and enthusiastic arrival in biomed. 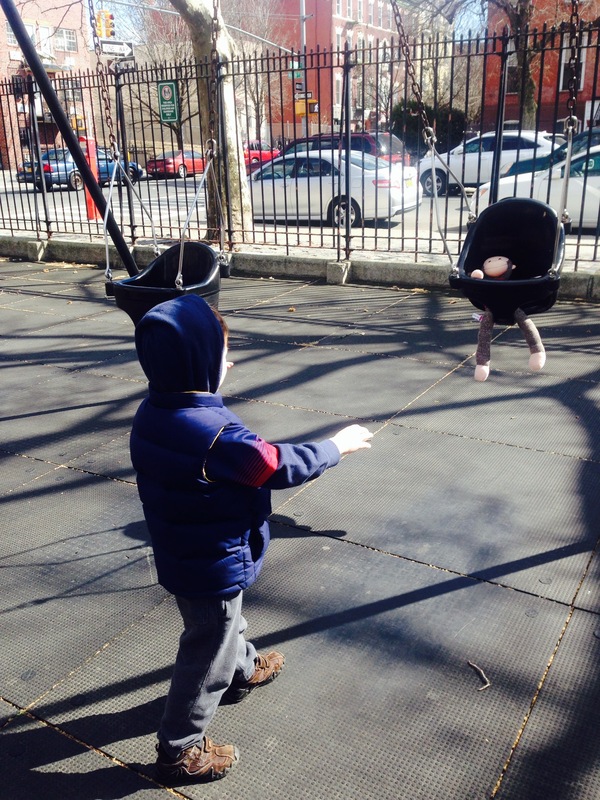 She’s started a blog and posted about her son’s experience with hippotherapy. I’ve seen the progress her Jaeden is making, and I like the forum she’s creating. Full Spectrum Essentials—it’s worth a look. “You sure you don’t want to try melatonin again?” asked Martin’s doctor, the one supervising the medical side of his recovery. The days before Martin’s autism diagnosis were dark times: Martin’s neuro-challenges left him so restless, so lost in spatiality, that he could not fall asleep unless physically restrained. Some nights it sufficed to sit next to the bed and hold his ankles to the mattress, so he couldn’t kick. Some nights we had to kneel over him to straddle his body, too. The worst nights, we had to find a way to still his legs, his torso, and his arms—only to watch his head thrash from side to side. No matter what we did, he needed more than an hour to fall asleep. Sometimes two hours. Or three. Even then, we couldn’t let go, or he’d wake. Martin’s pediatrician, at a loss as sleepless nights became sleepless months, referred us to the chairperson of the department of pediatric sleep disorders at a prestigious university hospital. That “expert” told us to make “picture charts” to help Martin understand what bedtime meant. She also diagnosed “restless leg syndrome” and told us to put Martin on iron supplements, which stained his teeth purple. It was a garish era for photographs of Martin. Meanwhile, Adrian and I slept in three-hour shifts, one of us trying to rest while the other pinned Martin. Until this past October, the sleeping situation, with some variations, remained that way: Martin fell asleep easily, and could be expected to sleep through the night, and when he happened to wake up wouldn’t go down again for three-to-five hours. Martin takes some prescriptions (among them right now are levocarnatine and compounded piracetem), along with a lot of homeopathic drops and OTC supplements. Whenever possible, I try to eliminate from his daily regimen. So a few months ago, when Martin was on an upswing, I decided to try phasing out melatonin. We’ve made so much progress, I reasoned. Why not investigate whether we’ve resolved some of the issues that made sleep so difficult? At the time (October), Martin was taking seven drops melatonin before bed. I eliminated one drop every one-to-two weeks. I’d reduce the dose by one drop, endure a few days of Martin taking a hours to fall asleep, wait until he adjusted and fell asleep within 30 minutes, and then reduce by one more drop. By Christmas, I had Martin off melatonin. Things weren’t perfect. He was taking longer to fall asleep than he had with the melatonin—45 or 60 minutes, instead of 30 or less. But I discovered an unexpected benefit: When Martin woke during the night, he did not stay awake. He fidgeted and called out for me and sought reassurance, and then promptly fell back to sleep. I realized that Martin had been dependent on melatonin to get to sleep. Its absence, at 2:00 or 3:00 am, had prevented him from returning to sleep. With Martin off melatonin, and capable of getting back to sleep, I’ve been able to attempt something new: nighttime potty training. Until now Adrian and I always left nighttime potty training on a back burner, reasoning that getting up to use the toilet was not worth the hours of wakefulness that would ensue. With that threat gone, we’ve been potty training since the week after Christmas. As my posts these past few weeks have described, Martin’s been having a tough time. Among other issues, he’s been experiencing evening hyperactivity, and therefore taking hours to fall asleep. That’s why his doctor asked if we’d like to add melatonin again. Here’s the thing: Melatonin is a crutch. It got us past the long nights while we worked on remedying the underlying causes of Martin’s sleeplessness. Martin no longer needs that crutch. I would rather find and eliminate the cause of the nighttime hyperactivity than use melatonin to mask the hyperactivity’s effects. The current melatonin situation reflects my overall approach to Martin’s autism. Of course I’m familiar with methylphenidate, amphetamine salts, guanfacine, and so forth—drugs that might improve Martin’s still-abysmal attention span. Maybe one day we’ll turn to such resources (in the end, I remain a pragmatist). But for now, while we have the time and opportunity, I choose to work toward eliminating the cause of his short attention span, instead of using drugs to mask the symptoms. “Martin, why don’t you go get yourself dressed like a big boy? Want to pick out your own clothes and get dressed?” I asked at nine o’clock yesterday morning. We had all slept late, and Martin was running around the house in jungle-print pajamas. I didn’t believe that he’d actually get himself dressed. Six months ago, I laid pajamas out on his bed and spent 20 minutes trying to get him to take off his clothes and put on the pajamas. I went away to let him concentrate, returned every two minutes to beg or threaten or cajole, even lost patience (not my finest parenting). Martin continually forgot his task. He rambled about nothing, jumped on the bed, played with Curious George. I absolutely could not get him to focus enough even to remove his clothes. Nevertheless, this morning I mentioned getting dressed only once before Martin said, “Okay!” and scampered down the hall to his room. Martin ran back to his bedroom. I returned to the kitchen. From afar, I heard a familiar sound. Martin’s bedroom dresser has thick metal handles attached to the drawers with leather loops, and when the handles are dropped, they clunk against the wood. The dresser is the last piece of a heavy German bedroom set that my older brothers once shared. As a kid, from my bed at night, I would hear that clunk and know Rudy and Eddie were getting ready to sleep. Now the sound ties Martin to his uncles. After another minute Martin came running down the hall again. I met him in the living room. He was wearing clothes. Martin arrived. As Adrian picked him up for a hug, I surveyed Martin’s choices. Navy blue sweatpants with CHICAGO printed on one leg. A white sweatshirt with blue stripes. Adrian set Martin down, then snapped the sweatpants waistband to make a confirmation. “You’ve got underwear,” he said. Back down the hall went Martin. “Am I pushing my luck?” I asked Adrian. On his feet were Velcro beach sandals, without socks. It was 34 degrees out. I was happy. Adrian was happy. Martin was happy. Autism, of course, has its ways of changing any day. At church, after the service but still in the sanctuary, I told Martin that he had enough time to run around in the gymnasium but would have to eat his snack in the car. (We had to get to an Anat Baniel Method therapy appointment.) Martin responded by screaming, repeatedly, interrupting the postlude and eliciting annoyance from fellow parishioners. I picked him up and carried him outside. A complete meltdown ensued. Last night Adrian tucked Martin into bed at 8:00 pm. Martin, who has recently discovered the joy of exiting his bed and running to the living room, went to sleep at 10:45 pm. Unlike Adrian, I cannot fall asleep while Martin is up and chatting. I got to bed after 11:00 pm and was one unhappy camper when 5:00 am rolled around. Fortunately, as I may have mentioned, yesterday Martin dressed himself without prompts. Which reinforces this truth: With every new morning comes fresh hope. Martin plays this weekend in Bedford-Stuyvesant, Brooklyn. I told him he was too big for these baby swings. He responded by putting his “little brother Curious George” in for a ride.